Happy days! The Pocket 4K arrived today. I brought it out to shoot and get used to it. I popped in the battery that came with the camera. Then I switched to a brand new (literally opened the packaging last night and charged it to 100%) an original Canon battery. I get in, want to charge both batteries and the Canon battery is stuck. I pull the little lock and the battery pops out only a tiny bit, but not enough to get a grip on it. I've tried to pull it out with double sided tape, and ducked tape, but the tape simply isn't strong enough. I'm at a loss of words and ideas here. I don't want to damage either parts. I'm very disappointed, as I had thought 3rd party non-branded batteries was something to stay away from, and a safe bet would be the official Canon branded batteries. Any good ideas? Any thoughts from you BMD? As reported in another thread, the Canon is slightly bigger, on the order of .1 mm. That may be your trouble, unreasonable as that narrow tolerance seems. I've seen tiny suction cups, for attaching hooks to a wall, which might work, if they're smaller than the exposed surface. That, or stronger tape. Somebody suggested double-sided carpet tape on dpreview, for same issue on another camera, with a wire or string taped between layers, to take hold of. Other people have resorted to small screw-drivers to pry it out, as reported here, with the obvious risks. Last edited by John Paines on Wed Oct 17, 2018 5:56 pm, edited 1 time in total. 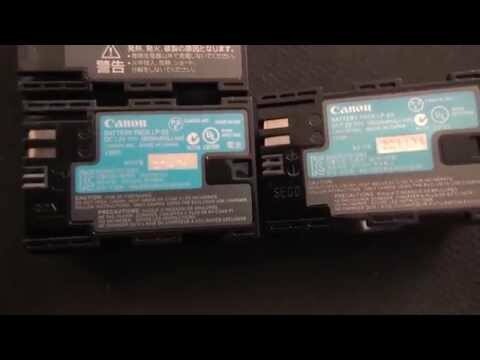 Make sure your Canon battery is genuine and not counterfeit. Before I read your replies I found a latch, probably related to locking it into chargers, and managed to pull the battery out with a small screwdriver. Unnecessary. I'm having second thoughts about the fact I have ordered more of them. So what is the best option for 3rd party batteries ? Ola Haldor Voll wrote: It's not counterfeit. How do you know it's not counterfeit? Where did you order from? Amazon and other third party marketplaces -- and even some big box retailers with "vetted" supply chains -- are full of counterfeit batteries. They look pretty much identical to the real thing. I did an entire series of articles about this on Forbes a while back. This is strange. Where did you buy your Canon battery from? I went on a shoot with my p4k and swapped batteries 4 times. All are brand new Canon batteries purchased from Best buy. Didn't have any issues with them getting stuck. I also thought I'd mention that back when I had a Canon 5diii, I purchased a very good Canon LP-E6 knockoff from Ebay (I didn't know any better and thought it was real. Should've known this from the 22$ price I paid) and it looked incredibly real, even the packaging. However, the battery did not fit in the camera. I figured that if i pushed further it would get stuck, then I found out it was a knockoff but it looked and even felt like a genuine Canon battery. If this is not your same case, then there's something wrong with your p4k. I would only stick to the Blackmagic batteries in that case. How do I know it's counterfeit? It was the typical Canon branded cardboard plate at the back, plastic wrap in the front. The battery says Canon, the packaging says Canon. How else could it not be a legit original Canon? I threw away the packaging, but it was identical to this. It was purchased here in Norway, not through some Amazon, Ebay or different vendor. I have 3 genuine canon LPE6n batteries, 4 wasabi lpe6, and 1 RavPower battery. All come out of the battery compartment just as the BMD battery does on my BMPCC4K. Check the battery thread, where they have a link to a spreadsheet with which batteries work and which aren't. Eugenia Loli wrote: Check the battery thread, where they have a link to a spreadsheet with which batteries work and which aren't. What is "the battery thread" ? I've searched for the keyword "battery" for 10 pages back in the Cinematography category. If you paid less than about $65 US...more like $25-$30 US, then it's counterfeit. I've been testing various batteries. I saw the battery your showing in that packaging and knew it was counterfeit because of the price but ordered one to see what kind of quality it was. I shot with it on a wilderness shoot this past weekend and it got stuck at the first battery change - had to pry it out with a small screw driver. It was only 25 bucks and I haven't had time to deal with it but I'm going to contact the vendor later and tell him I knew it was fake but being so poorly specced that it got stuck in the camera was unnacceptable. FWIW I've tested 6 or more 3rd party brands so far and that fake Canon is the only one that got stuck. Beccause yours did also, then yeah - you've got the same bad knock off. Throw it away or return it but definitely don't let it near your camera again or any Canon battery that doesn't come from a top dealer. I was mistaken about the packaging. I found the correct photo of it. It wasn't plastic, but entirely cardboard. If it truly is a fake I will have to talk to the seller. Certainly not OK with putting it back in. I've concluded it's a fake. Based on info in this article it's a near perfect fake. The only thing that stood out is the rating of the battery. All other tiny details like square corners, distance from one element to another and other tiny details like the font and size of the T and C in circles are spot on. Your packaging appears to have other tell-tale signs of a fake. Ola Haldor Voll wrote: I've concluded it's a fake. Based on info in this article it's a near perfect fake. Could you measure your fake? Way way more expensive..but take a look at the CORE PowerBase Edge. Lot longer duration. I think you would get the adapter for dummy battery, but you would get hours of use. I ran into fake Nikon batteries about five years ago. It is a real problem. The fake one swelled up and would not come out of the Nikon super-zoom camera I had then. Found a website where you could see the minute and subtle differences in the labeling on genuine batteries vs. the fake ones. The counterfeiters have no qualms about stealing trademarks, etc. This is why I only buy batteries from reputable dealers, not from eBay or Amazon third party sellers. This way, you know you will get the genuine battery you are paying for, and not a counterfeit. I did buy a used Canon battery off eBay, and it died after being used several months, came with the Canon OEM Charger, so it was basically free anyway. That ended my buying batteries from eBay. Last edited by Denny Smith on Thu Oct 18, 2018 5:00 pm, edited 1 time in total. Yes, it often is little clues like this which gives the fakes away. Other than this, the counterfeiters have become really, really good, and have even gotten their products into otherwise vetted supply lines. Robert Niessner wrote: Could you measure your fake? I don't have a super scientific way of measuring. I did my best. It's bigger in every way. It fits my Canon 60D though. Justin Jackson wrote: Way way more expensive..but take a look at the CORE PowerBase Edge. Lot longer duration. I think you would get the adapter for dummy battery, but you would get hours of use. While it might be good in some cases, it's way too bulky and not an option in my case. I'd rather have a 95Wh mini v-lock and D-tap to LP-E6 or D-tap to power plug on the side. Ola Haldor Voll wrote: I was mistaken about the packaging. I found the correct photo of it. It wasn't plastic, but entirely cardboard. I also ordered two Canon LP-E6 batteries witch I thought were originals, but they are exactly same looking as yours, all the numbers and 1865 mAh rating too. I don't have the pocket 4k yet but I guess I am going to try using them. I must say that otherwise but this 1865mAh rating they look wery much like originals. Yes, but only the newer LP-E6N has a MA rating above 1800. I would send them back, as they are not OEM Canon batteries, and do not meet their description. I am having the same battery issue, but I am having it with the battery that came in the box with the BMPCC4k Any solution for this? It isn't very practical to have to pry out a battery every time you want to change it. Mine got stuck as well. I used an aftermarket battery that appears to be the same size as the battery shipped with the BMPCC 4k. Unfortunately I could not get the battery out for the life of me. I called up Black Magic and they sent shipping label and a week later a whole new camera is being shipped. They probably realized the terrible fault of the camera and found a way to fix it (Maybe not putting the S/N label inside the battery compartment!) with the new body they are sending. An inconvenient issue but glad BM resolved it appropriately. Before I read your replies I found a latch, probably related to locking it into chargers, and managed to pull the battery out with a small screwdriver. Unnecessary. How much effort did this take/how deep was your screwdriver? Just ran into this today. Tried to just nudge some space with an exacto but it wasn't enough or something else. I had exactly the same thing happen to me. That was a month ago, so now I cannot be certain if it was the battery that came with the camera, or a third party battery. Anyway, the battery was stuck and would only come out a few mm when released. I eventually used a curved tweaser to pop it out. But here's the thing. A small bit of grey plastic (flat and roundish with a short arm) came out too. Not off the battery for sure. It's very hard to see into the depth of the battery well of the camera, but it looks like there might be something down deep and near the left edge of the flat part of the well. A switch of some kind? Now minus it's actuator. In any event, it would not appear to impede operation of the camera. Maybe somebody from BM can comment. First time out with the BMPCC4K and I've got the stuck battery problem. And this was not a cheap battery, but the Hahnel HLX-E6N which is actually recommended by some re-sellers. This is very frustrating and it seems bad design on BM's part rather than the battery itself (I've used 3rd party batteries with every other camera I've had without problems). Anyone got any clever way of getting the battery out other than the obvious prising-out-with-screwdrivers?